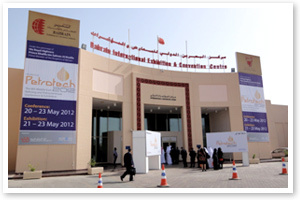 Middle East Petrotech 2012, an international exhibition that showcases technologies related to refining and petrochemicals, recently came to a close. The exhibition was held at the Bahrain International Exhibition and Convention Centre in the Kingdom of Bahrain from May 21 to 23, 2012. TLV participated in the exhibition together with the respected Yusuf Bin Ahmed Kanoo Group. A large number of visitors came from neighboring countries such as Saudi Arabia, Qatar, Oman, and many more. The exhibition was a good opportunity to mingle with visitors newly interested in TLV products as well as with current TLV product users. Many visitors came in groups, with senior staff taking the opportunity to use product cross-sections on display to explain steam trap operation mechanisms to their junior members. Much praise was received for the durability and performance of TLV products. The three-point seating available in some of our Free Float® steam traps appeared to be one of the most appreciated features in the TLV line-up. Thank you to all those that visited TLV at the conference.